Cut back on unnecessary costs by having all the parts needed to get the job done in one trip. 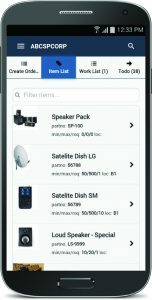 The Clear Spider mobile app connects you to one of the world’s most powerful inventory management systems. 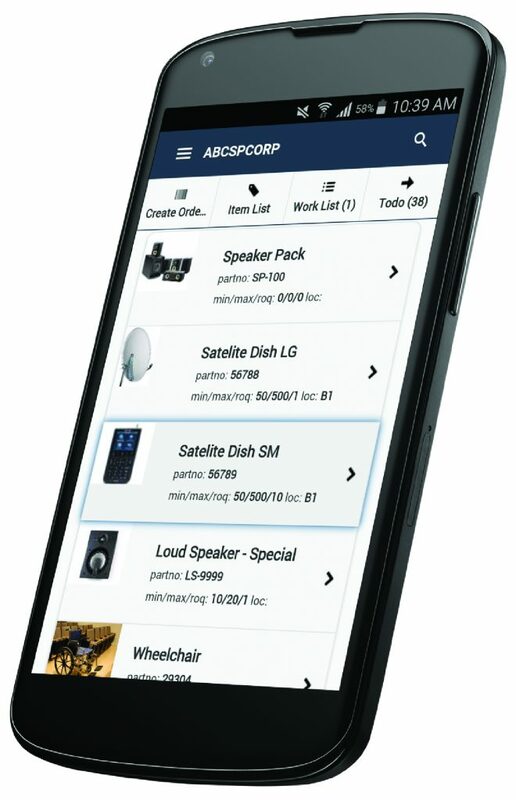 Clear Spider’s smartphone app allows users to access their inventory system from anywhere, at anytime. Our system provides you with real-time information so you can manage vehicle inventory more effectively. View inventory levels at all locations whether you are in the office, at the warehouse, or on the road. Avoid stockouts, increase accuracy, and get the job done in one trip. Always have the items you need, when you need them. Real-time system updates give you up-to-date information in the palm of your hand. Quickly locate items whether they are in the warehouse or on a service vehicle. With the click of a button you can know if an item is on your vehicle, or the nearest location you can find it. Only stock what you need to optimize storage space on service vehicles. Identify trends in item consumption so you can stock your trucks and vans as effectively as possible. Get rid of items that are collecting dust to make room for ones with a higher turnover. Technicians can easily record transfers between vehicles using a smartphone. Transfers are updated in real-time in the inventory system so that your records are always up-to-date and accurate. Mobile transfers give technicians a way to easily communicate item usage with everyone out on the field and in the office. Keep track of every transaction that happened on any given day. 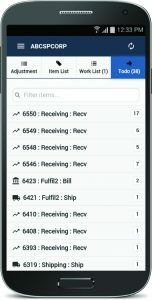 View detailed records of item consumption at any time. Know the time, quantity, and for what order items were consumed. Having this information stored in the system makes it easy to access and review historical data. Setting up an inventory system can be as simple as installing an app on your smartphone. Clear Spider has one of the most powerful inventory management systems in the world. 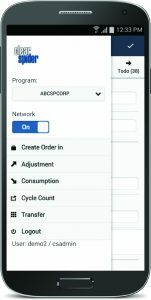 Our mobile app now connects you to the back end system in a user-friendly way. Managing your inventory on the go has never been easier. Clear Spider gives field service staff the freedom to access inventory information at anytime from anywhere. Using their own personal smartphone or a company provided device, technicians can view inventory levels, edit orders, record transfers, and more. All inventory information is stored on the cloud and can be updated from a smartphone. Access up-to-the minute information at anytime, from any location. Use the camera on your smartphone to scan items and quickly record transactions. Use a smartphone to access the Clear Spider system at anytime and from any locations. Getting started with the system is as easy as installing an app. Use the camera on your smartphone to quickly scan items and record transactions. No need to install external devices to use our system. Each item can be assigned a specific truck, van, or warehouse location. When transferring, the item location will be updated immediately in the system. Real-time information makes it easy to find the item you are looking for, at the most convenient location. Clear Spider provides inventory information for all locations in real-time. Technicians can see what is available in each vehicle or warehouse location. Save time by eliminating the need for blind requests and calls. Clear Spider is very user-friendly. We allow clients to customize functionality based on user roles. Technicians can easily learn how to use the system and immediately increase their productivity. Technicians can easily confirm they have the inventory they need to meet each day’s service requests. View an item list at the beginning of each day to stock each vehicle accordingly. Cut back on unnecessary costs by having all the parts needed to get the job done in one trip. Set custom roles for each user based on their work requirements. Give access to the entire system or limit functionality to optimize efficiency. Choose what information technicians can access to keep data safe. Know what items you have, how many of each, and where they are in real-time. Clear Spider gives you full visibility into inventory levels across your organization. Make sure your vehicles are always fully stocked and that you don’t run low on any items in your warehouse. Manage inventory at all locations to make sure you always have the inventory you need. Maintain inventory levels in the warehouse and know what all of your vehicles need to meet each day’s service requests. Cut back on unnecessary costs by having all the parts needed to get the job done in one trip. Have all vehicles fully stocked before they leave for the day. Automatic replenishment effortlessly determines how much stock is needed for each vehicle and warehouse location. The system uses custom order levels and reorder points to ensure items are replenished on time. Manage your inventory even when something goes wrong. If an issue or defect is found with an item, Clear Spider is able to track that item no matter where it is being returned from. View the reason and validity of any return to maintain a complete audit log of all item usage. Inventory is being tracked in real-time. When an item is consumed or transferred, it immediately shows in the system. This gives front office staff access to the most accurate and up-to-date information. Quickly make informed decisions from anywhere at anytime.